Our school feels it is of the utmost importance to have good systems for protecting children and safeguarding their welfare, throughout all the activities which the school undertakes. This means that staff and volunteers must be alert to possible concerns about every pupil, and to report these in a proper fashion. The school has a safeguarding and child protection policy: parents may request a copy of this. In many cases the school is obliged to refer children to Children’s Social Care staff, for children to be assessed for their needs or if an investigation into possible child abuse is required. In some cases there will already have been discussions between school staff and the parents of the child, and the situation and concerns will not be a surprise to the parents. However, parents may not be told that the school has referred their child to Children’s Social Care if it is thought that this might put the child at risk. If you think your child may have been abused you can contact the Children’s Social Care office or the Local Authority’s Allegations Manager, Safeguarding Unit direct. If you think the abuse may have happened in school, contact the Designated Senior Lead for Safeguarding and Child Protection, who is Mrs C Price, Acting Headteacher. If you think your child has been hurt, arrange to visit your doctor. Comfort and reassure your child. Parents should be aware that when Police attend an incident of domestic violence/abuse involving parents from Badgerbrook, then we as a school will automatically be informed first thing the next morning. All Leicestershire Schools are now part of a safeguarding initiative, which aims to improve outcomes for children and families affected by domestic violence and abuse. This scheme has been designed to provide early reporting to schools of any domestic abuse incidents that might have an impact on a child that attends their school. 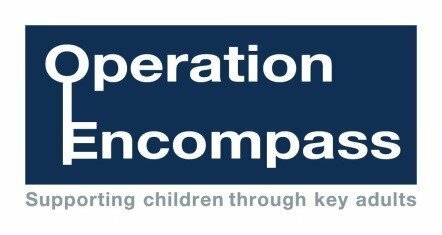 The approach, known as Operation Encompass is being rolled out across the UK. In Leicestershire the scheme is run in partnership between Leicestershire County Council, Leicester City Council and Leicestershire Police.